The Requiem for Fr. Miller will be celebrated at All Saints' at 2 p.m. on Saturday, 1 November. A collation will follow. The next was 19 October for the Nineteen Sunday after Pentecost, just down the road from St. John's: Vespers at St. Paul Church, 29 Mt. Auburn St. The last "away service" is Choral Evensong, 2 November, within the Octave of All Saints, at 5:00 pm at All Saints' Church, Worcester. The Choir of St. Paul's, Harvard Square, joined the Ashmont Choir of Men & Boys to sing the service of evensong on the third Sunday of Lent, 23 March 2014. We were happy to welcome back the Choir of St. Paul's, along with Fr. Michael Drea, the Pastor of St. Paul's, John Robinson, the Director of Music, and Jonathan Wessler, the Assistant Organist. This is one of an occasional series of shared services where St. Paul's and All Saints' travel the Red Line to sing at each other's parish. We have been sharing these evening services since 2011 and are delighted to continue this collaboration between the two remaining liturgical boy choirs in the Boston area. Please see here for the music for this service. The Rt. Rev. M. Thomas Shaw, SSJE, diocesan bishop of Massachusetts, preached at All Saints' at its Candlemas service of Solemn Evensong & Benediction on 2 Februrary. Bp. Shaw last visited All Saints' at the deanery confirmation in 2009. We were very grateful that he was been able to squeeze us into his busy schedule as he nears his retirement. See here for more information about Bp. Shaw. The afternoon of the Second Sunday after the Epiphany, 19 January 2014, the All Saints Choir of Men & Boys joined the Men and boys of the Choir of St. Paul's Church, Harvard Square in a Vespers service at St. Paul's Church, Harvard Square. For several years now these two boychoirs have been singing at each other's parish once or twice during the year. We are delighted to continue this ecumenical Red Line tradition. The All Saints' Boy Choir were invited to sing at the interfaith inaugural service for the Mayor-elect of Boston, Marty Walsh. The service was held Sunday afternoon, 5 January 2014, at the Old South Church and was hosted by Reverend Jeffrey Brown. 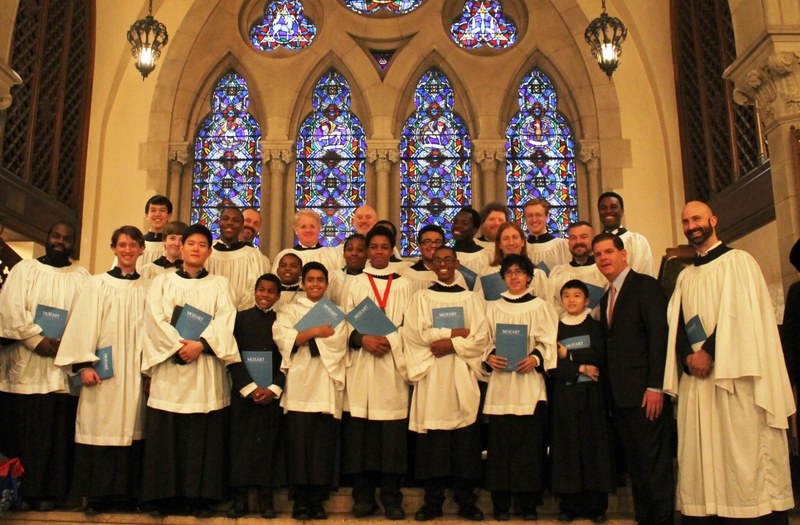 They boys were excited to travel into Back Bay and participate in with other choirs in this city-wide service. They beamed as they greeted the mayor-elect and shook his hand. 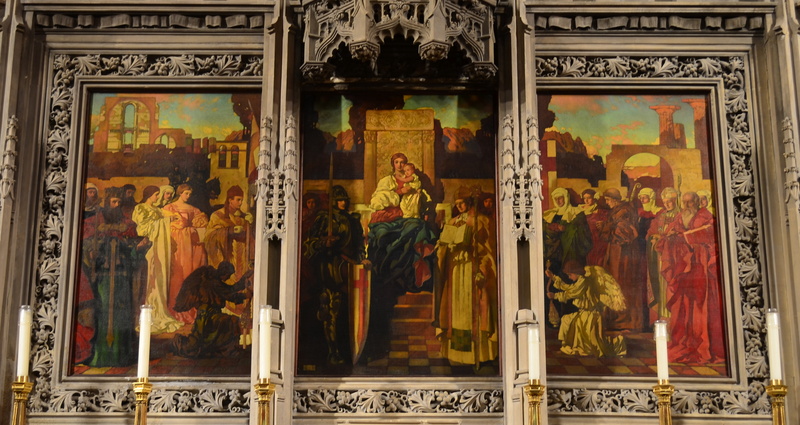 George Hallowell's triptych altarpiece, "The Virgin Enthroned," 'strengthens considerably the significance and comprehensiveness' of the theme of the chancel program: all the company of heaven. The triptych contributes seventeen saints to the total of over 125 figures depicted in the reredos, the plate, and the chancel carving. 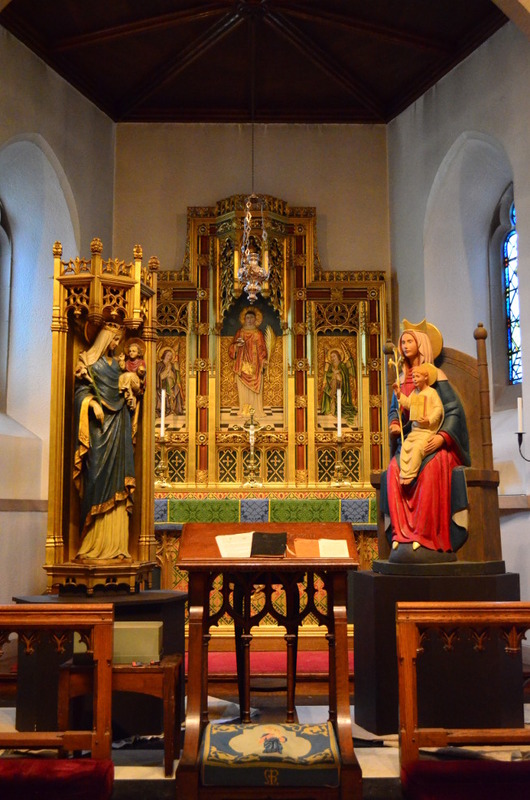 The parish celebrated All Saints Day, its feast of title, on Friday, 1 November 2013, with with a low mass in the morning and again in the evening with a procession to the shrine of Our Lady of Dorchester and a solemn mass. We were delighted to hear the Rev'd Truman Welch, Rector of the Church of the Good Shepherd, Waban, preach at the solemn mass. See here to read more about Fr. Welch. The mass was sung by the All Saints Choir of Men & Boys. Missa 'O quam gloriosum est regnum' by Tomàs Luis de Victoria was the setting. His motet of the same name was the communion anthem. The organ voluntaries were Andante sostenuto (Symphonie Gothique) by Charles-Marie Widor and Prelude in B minor by Johann Sebastian Bach. 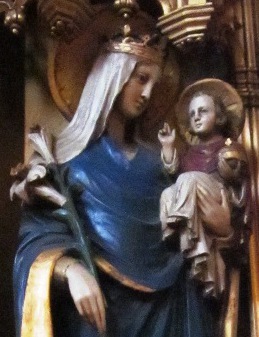 This black high altar frontal is used at requiems. Around a plain cross is the inscription, IC XC NIKA, the Greek abbreviation for "Jesus Christ Conquers," proclaiming the good news that by his cross and resurrection Jesus Christ conquers. All the Faithful Departed were commemorated on Sunday, 3 November, at both the 8 and 10 o'clock requiem masses. The mass setting at the 10 o'clock mass was Josef Gabriel Rheinberger's Requiem in E-flat major. 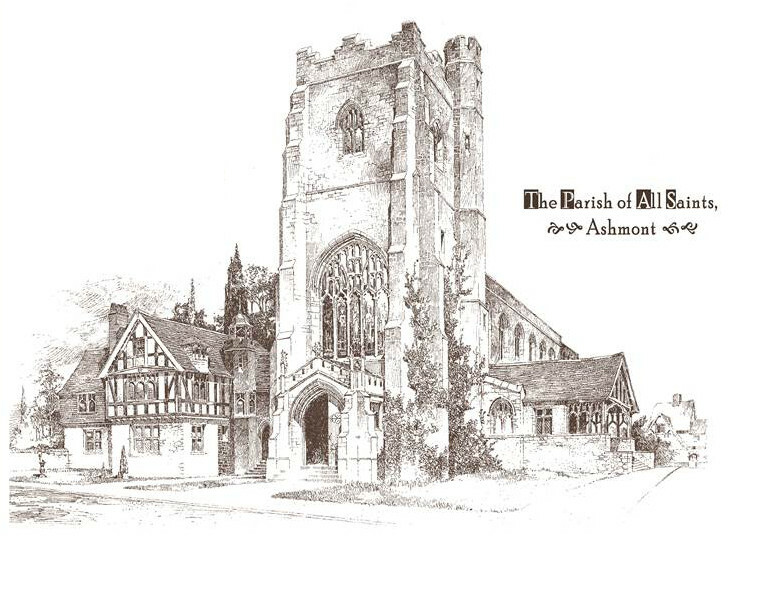 Later that day, the choir travelled to All Saints', Worcester, to sing a service of Choral Evensong within the Octave of All Saints with the Worcester All Saints'. See here for the service music. All Saints' was privileged to be able to celebrate the Feast of St. Michael and All Angels twice this year: once at Ashmont in the morning and a second time that evening hosted by S. Stephen's, Providence. The feast was observed at the usual Ashmont Sunday masses, 29 September 2013, at 8 a.m. and 10 a.m. The All Saints' Choir of Men & Boys sang the Solemn Mass at 10 o'clock. The mass setting was Josef Gabriel Rheinberger's Missa Brevis 'Misericordias Domini' and the anthem was his Angelis suis (Ps. 91:11-12). 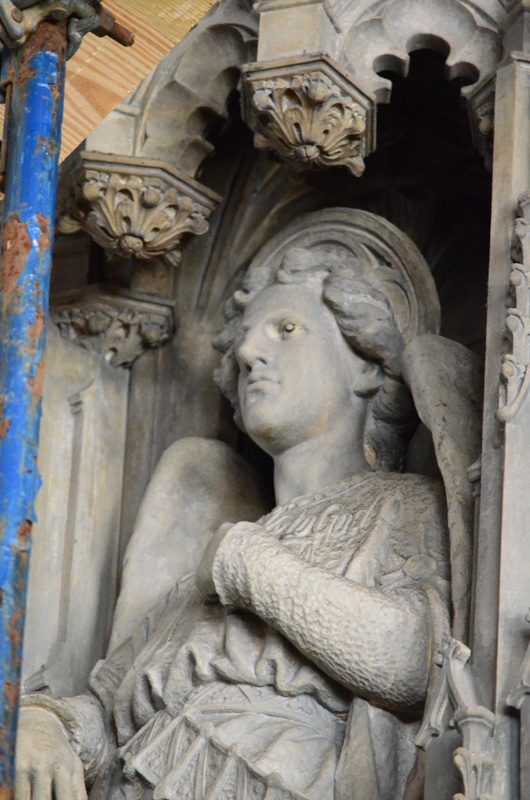 St. Michael peers past scaffolding erected adjacent to the high altar reredos. The choir then traveled to Providence to sing a service of Evensong and Benediction at S. Stephen's Church, followed by a reception in S. Stephen's newly renovated Great Hall. All Saints' celebrated the Feast of the Assumption Thursday evening 15 August 2013, amidst the scaffolding with a Procession and Solemn Mass sung by the Choir of Men and Boys. The setting was Philip Stopford's Keble Missa Brevis. There was a reception following the mass. See the Building Restoration photo blog to learn about the temporary relocation of Our Lady of Dorchester and Our Lady of Walsingham. The Feast of the Ascension fell on 9 May, this year. 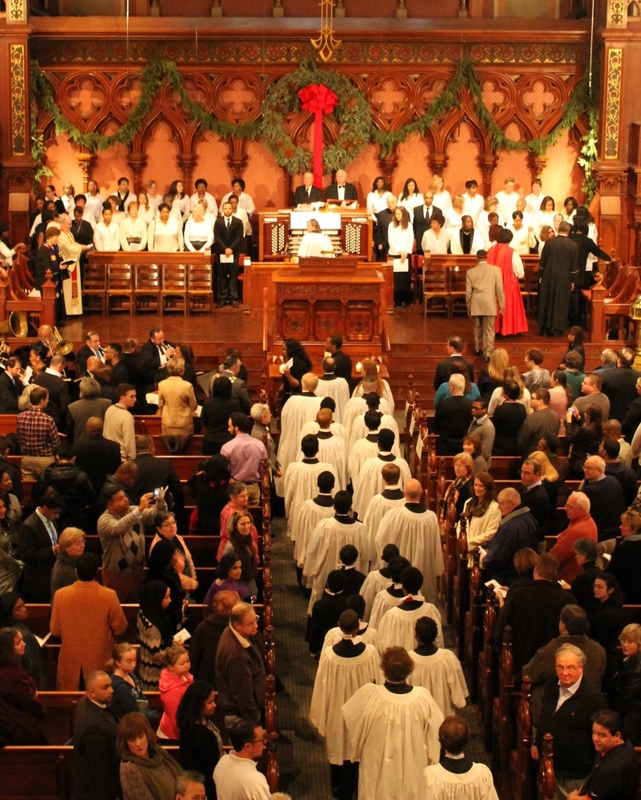 As we usually do, the folk from All Saints will took the Red Line from Ashmont to Beacon Hill to celebrate this great feast of the year with our sister Parish, the Church of the Advent, with a procession and orchestral mass. The preacher was the Rev'd Mark Edington, priest-in-charge at St. John's Church, Newtonville, Massachusetts. The choir of St. Paul's Church,, Harvard Square, came to Ashmont Sunday afternoon, 12 May 2013, for a 4 pm Solemn Evensong & Procession for the Sunday within the Octave of the Ascension. Earlier in 2013 the All Saints' Men and Boys Choir traveled to Harvard Square to sing with the St. Paul's Choir. We were happy to return the hospitality. The organ voluntaries were played by Dr. Jonathan Wessler, Assistant Organist at St. Paul's, Harvard Square. Many people in Dorchester go to bed hungry every night. Our parish does its small part to address this problem by contributing food to two local food pantries. In 2013, we have given food donations to the food pantry at St. Mary's Episcopal Church in Uphams Corner and the food pantry at the Codman Square Health Center. Please help by bringing the following items: canned goods, pasta, and peanut butter to the church by the second Sunday of each month. Items can be left in the baskets at the front entrance to the church or in the hallway at the top of the handicap ramp. The All Saints' Choir of Men & Boys has been in the news twice in 2013. The Winthrop Sun Transcript, in their Thursday, 20 December 2012 edition, featured a picture of the All Saints' Men & Boys Choir singing the 11th annual Lessons and Carols at St. John the Evangelist Church, Winthrop, Massachusetts. After the jump there was three-quarters of a page of photographs of the choir, the clergy, and the reception. The Annual Mass & Meeting of the American Region of the Society of Mary took place on Friday & Saturday, 3 & 4 May 2013, at S. Stephen's Church, 114 George Street, Providence. The Rt. Rev'd Lindsay, OGS, the Administrator of the Anglican Shrine of Our Lady of Walsingham, was in the country to address this meeting. Friday at 6 pm he presented an address on "One Faith, Two Shrine," with panelists the Rev'd Henry Bohah, Catholic Chaplain, Brown University, and the Rev'd Dr. Arnold Klukas, Professor of Ascetical & Liturgical Theology, Nashotah House, Wisconsin. 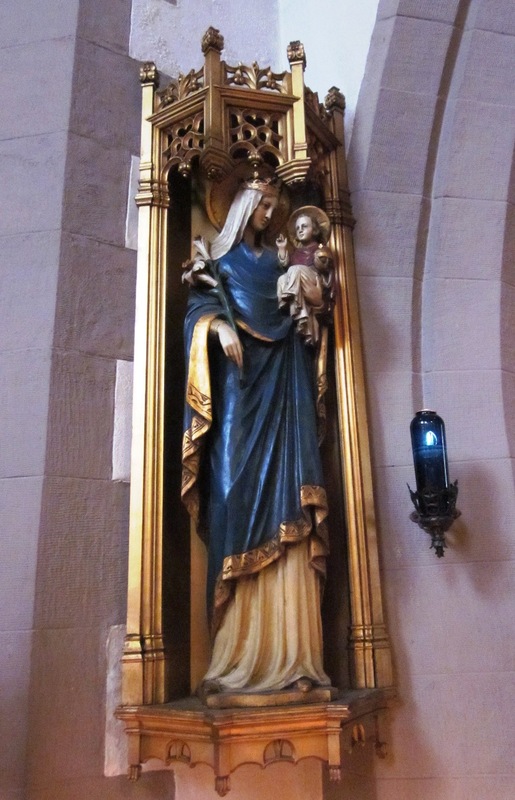 Vespers of Our Lady were served at 7 pm that evening. Bp. Irwin preached the Solemn Mass at 11 am the next day. There was a lunch after the mass. See this link for a poster describing the event. The Rt Rev'd Lindsay Urwin OGS, Administrator of the Anglican Shrine of Our Lady of Walsingham preached at All Saints' on the Sixth Sunday of Easter, 5 May 2013. This was the second visit to Ashmont in recent memory of the administrator of "England's Nazareth," for Fr. Philip North, Bp. Irwin's predecessor, has also graced the pulpit at Ashmont. 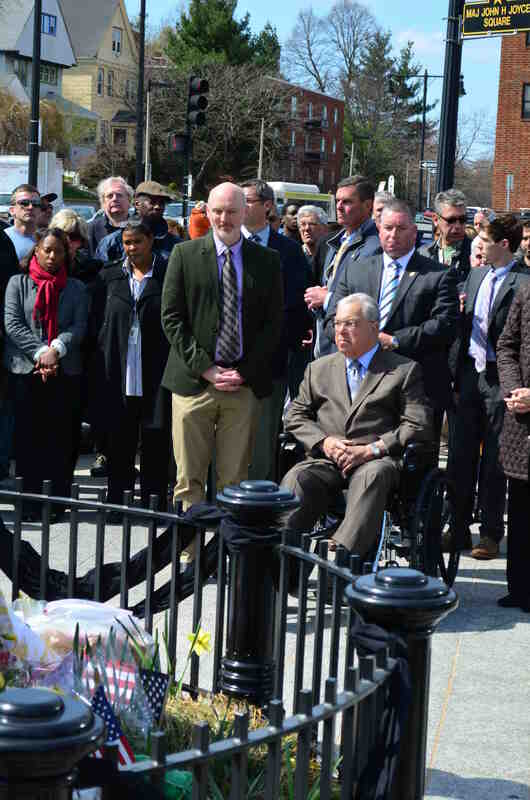 Together with President Obama, Governor Patrick and Mayor Menino requested a moment of silence at 2:50 p.m. on Monday, 22 April 2013 for the victims of the Boston Marathon bombings a week earlier. After a minute of silence in Peabody Square the stopped clock was restarted at 2:51. The large bell in the All Saints' tower chime tolled three times for the death of our neighbor, the child Martin, and then it tolled eight more times, once for each year of his short life. Please pray for the repose of Martin's soul. Pray also for strength and healing for Bill, Denise, and Jane. And, for the others who have died, and for all those affected by last week's terrible events. Give rest, O Christ to thy servants with thy saints, where sorrow and pain are no more, neither sighing, but life everlasting. A benefit concert entitled, "Children Sing for Peace," was held on Saturday, 27 April at 7 p.m. at Saint Mark Church, 1725 Dorchester Avenue, Dorchester, to directly benefit the Richards Family. Participating choirs included our own All Saints' Choir of Men and Boys, the Boston City Singers, the Junior Choristers from St. Paul's, Harvard Square, and Nick Page, Song Leader of the Mystic Chorale. Dorchester Reporter tells the story of Richards Family, the Ashmont clock winder, and the stopped clock in Peabody Square. Visit RichardFamilyFund.org to see how you can help this devastated family in their time of grief. The Rev. Carl Scovel was our Guest Preacher for the Sacred Triduum this year. These Great Three Days celebrate the Death, Burial, and Resurrection of Jesus Christ and at Ashmont are comprised of the services of Maundy Thursday, Good Friday, the Easter Vigil, and Easter Morning. The Rev. Scovel was born and grew up in North China where his parents were medical missionaries. They were interned by the Japanese during part of World War II. He is a graduate of the Shanghai American School, Oberlin College and Harvard Divinity School. He has served two churches, The First Parish of Sudbury for ten years and King's Chapel in Boston for thirty-two. During that time he travelled some, preaching at various churches, frequently trying to interpret Bible passages and Christian teachings to mainstream Unitarian Universalist churches. Rev. Scovel and his wife share a house in Jamaica Plain with their eldest and her family. A son and his family live a mile away. Their youngest and her family live in Toronto. 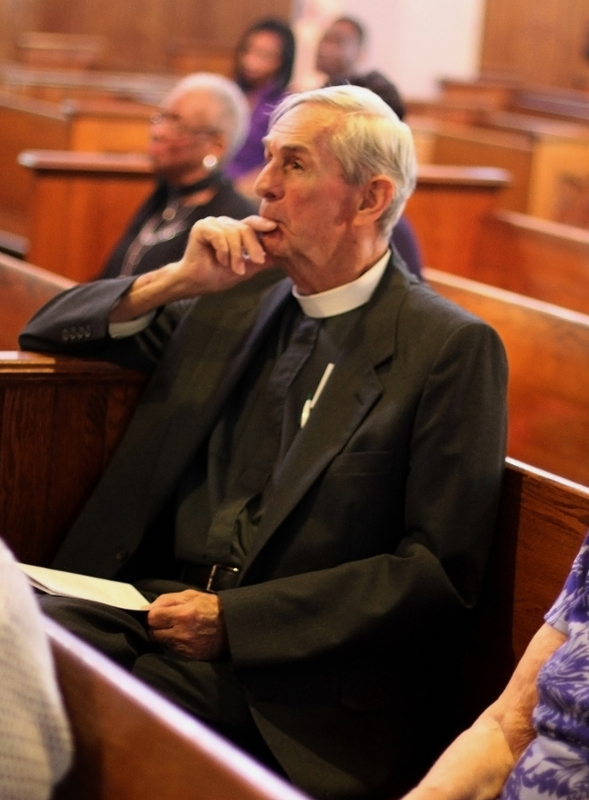 Now retired, he continues to do some counseling and spiritual direction and occasionally teaches classes in parishes. While studying at Harvard, Rev. Scovel and Fr. Purnell were roommates. Over the years he has graced our pulpit a number of times. We are delighted and honored to continue that tradition. Our Lord's last sayings from the cross have held a special place in the devotion and spirituality of Christians throughout the ages. Source of countless sermons and meditations, they have even been the inspiration for musical composition. Taken from all the Gospels, these seven 'words' powerfully focus our attention on the sacrifice which Jesus is at that moment offering and the redemption which he is procuring for those who turn to him in faith. The series began on the Sunday before Ash Wednesday, the traditional Quinquigesima. As many in the parish are aware, All Saints' has been challenged to raise $500,000 to support the restoration and preservation of our church buildings. This money will be matched 3-to-1 by the generous donor funding the restoration project. The resulting $2 million will be used to create the Parish Preservation Fund, which will help pay for future capital repairs to the building. To lead the Parish through the fundraising, a Capital Campaign Committee has been formed, which is co-chaired by Bob Godfrey and Tim Van Dyck. To kick off the Capital Campaign, the Committee is hosted a lunch directly after Mass on Sunday, 24 February 2013, in Peabody Hall. During the meal, Committee members provided a brief update on the status of the building restoration project, and explained in detail how the Capital Campaign will work. Then, members of the Parish were asked to consider what kind of gift they would be able to make toward this important Campaign, which will help ensure a healthy future for All Saints. Tim suggested that parishioners consider their contribution in terms of a multiple of their current annual giving to the parish: one times, two times, three times their annual pledge to the parish. Tim also urged every parishioner to contribute. It is essential that we demonstrate our donor our own commitment to the health of the parish. On Sunday, 10 March 2013, at 3 o'clock in the afternoon, Andrew Sheranian offered an organ recital at St. Paul's Church, Harvard Square. Hymnus: "Christe, qui lux es et dies"
The afternoon of the Third Sunday in Lent, 3 March 2013, at 4 o'clock, the All Saints Choir of Men & Boys joined the Men and boys of the Choir of St. Paul's Church, Harvard Square in a Vespers service at St. Paul's Church, Harvard Square. Last year the St. Paul's choir came to Ashmont for a special Marian Solemn Evensong & Procession. And, last year, also on the Third Sunday in Lent, All Saints' went to Harvard Square, to sing a Vespers service with the St. Paul's choir. We are delighted to continue this Red Line tradition between our two choirs of men and boys. Our celebrant and preacher for the Third Sunday of Lent was Fr. Sam Keyes. Fr. Keyes is a priest of the Diocese of Dallas. He has studied at Nashotah House, and is currently a graduate student at Boston College in historical theology, with particular interest in the medieval period. Fr. Keyes covered the masses last July during the Rector's vacation. We are delighted to have welcomed him back to All Saints' again. Despite snow banks and crowed roads, the faithful came out to support the Shrove Tuesday Pancake Supper in the lower hall of the Parish House. Proceeds of the supper benefited the Choir Fund. The Friends of the Choir prepared the meal and the trebles of the choir provided table service. Several times during the meal the teens took a break from serving food to serenade our guests. Our nascent Ashmont acapella group borrowed a page from the Harvard Glee Club and performed "Good Old Acapella" and a rendition of Michael Jackson's "Beat It." Peter Johnson was the guest preacher for All Saints' at the Sunday 10 a.m. mass on 3 February 2013. Mr. Johnson is a postulant for Holy Orders in the Diocese of Connecticut. He is a graduate of Hinsdale High School in Illinois and of Yale College where he received honors in Humanities. At Yale he was chairman of the Tory Party of the Yale Political Union (Yale's debating society), president of Choose Life at Yale, and a member of the Yale Baseball Club. He is currently a second year student at the Berkeley Divinity School at Yale. He is the holder of a full merit scholarship from the Yale Institute of Sacred Music. 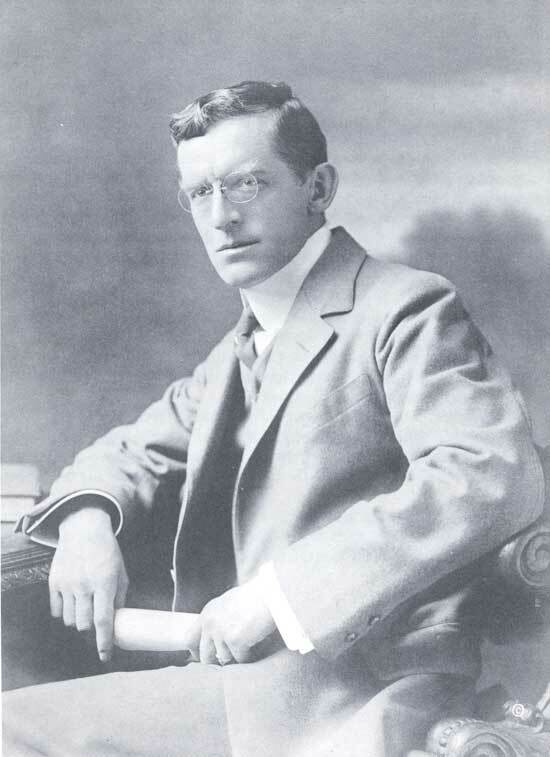 Prior to attending Berkeley he served as administrator of Christ Church, New Haven, the great Anglo-Catholic parish in that city. He currently serves as seminarian intern at Trinity Church on the Green in New Haven. He is an ensign in the U.S. Navy and part of the Chaplain Candidate Program.